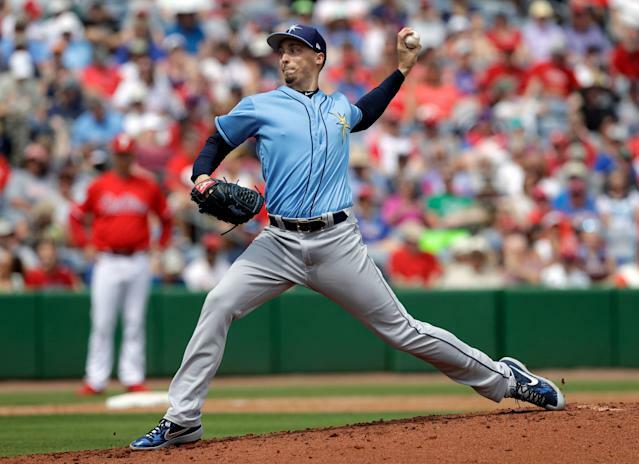 The Tampa Bay Rays have reportedly locked up Blake Snell with a long-term contract. According to ESPN’s Jeff Passan, Snell and the Rays have agreed to terms on a five-year extension worth $50 million. Snell, a 26-year-old lefty, is coming off a Cy Young Award-winning season in which he led the American League in wins (21) and earned-run average (1.89). Per Passan, Snell’s new contract is the most lucrative deal ever for a player with just two years of MLB service, passing Gio Gonzalez’s $42 million deal with the Washington Nationals in 2012. Earlier this month, Snell, through his representation, voiced his displeasure with the Rays’ decision to renew his contract without a jump in compensation. But that all changed Thursday when the two sides agreed to the new deal. Snell was a first-round pick of the Rays back in 2011 but did not make his MLB debut until 2016, when he went 6-8 with a 3.54 ERA in 19 starts. He had an up-and-down run in 2017, including a stint in Triple-A, before finishing out the season with a 5-7 record and 4.04 ERA in 24 starts. That preceded a meteoric rise in 2018. Snell’s 2018 ERA, 1.89, was the lowest by a starter in the American League since Pedro Martinez’s brilliant run with the Boston Red Sox in 2000. Snell’s presence atop the rotation helped the Rays win 90 games, finishing behind the Red Sox and New York Yankees in the American League East.